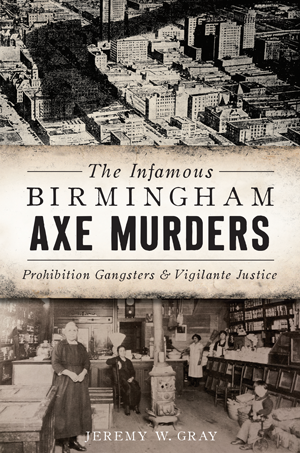 A reign of terror swept the streets of Birmingham in the 1920s. Criminals armed with small axes attacked immigrant merchants and interracial couples, leaving dozens dead or injured over the course of four years. Desperate for answers, police accepted clues from a Ouija board, while citizens clamored for gun permits for protection. The city's Italian immigrants formed their own association as protection against the Black Hand, an organized band of brutal criminals. Eventually, the police turned to a dangerous and untested truth serum to elicit confessions. Four black men and a teenage girl were charged and tried, while copycat killers emerged from the woodwork. Journalist Jeremy Gray tackles one of the most curious and violent cases in Magic City history. Jeremy Gray has covered the news in Alabama since 1999. After years of chasing police through the Magic City as night reporter for the Birmingham News, he is currently a managing producer for Alabama Media Group, helping share breaking news on AL.com and in the pages of the Birmingham News, the Huntsville Times and Mobile’s Press-Register. A Bessemer, Alabama native and father of two, Gray is a graduate of McAdory High School and the University of Montevallo, and he lives in Moody, Alabama.